Thapovan Heritage Home follows the concept of being a home away from home for our distinguished guests, who want to unwind and recharge with Ayurvedic treatment or enjoy the beautiful garden and nearby Nellikunnu Beach in a private atmosphere. For those of our guests, who want to learn about the real life in Kerala, we will take them to neighboring villages, markets and festivals. For a deeper understanding of Indian Classical arts we are conducting house concerts and lecture demonstrations of music and dance as well as visits to concerts in Trivandrum. Thapovan is nestled within verdant surroundings... just away from the din and bustle of city life. 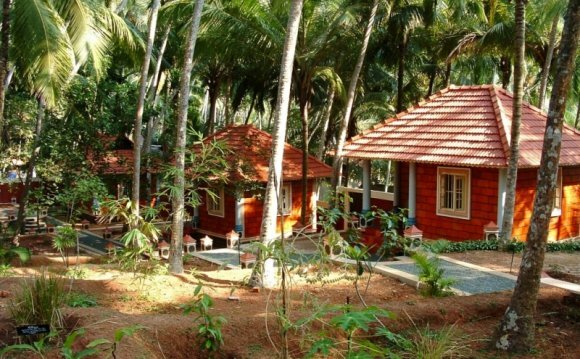 Perched exquisitely on top of a hillock and cliff, the heritage home is bordered by the virgin Nellikunnu beach. It also lies in proximity to other tourist attractions like Kovalam, Thiruvallam and Vellayani. The cosy shade of swaying coconut palms. The caressing roar of the majestic sea. The divine fragrance of Thulasi. The stimulating rhythms of Kathakali. The secure confines of Nalukettu... The enchanting notes of Kerala come alive in the idyllic surroundings of Thapovan. The heritage home where the Gods would love to come to rest. Architectural marvels in wood. Carved religiously on the principles of Thachushastra- the mystical science of engineering. Gabled roof, imposing wood columns at the entrance, panelled walls...Step in and transport yourself into a pristine world that had challenged technology with aesthetic ingenuity. Relax peacefully in this serene ambience. You will be caressed by the soft roar of the waves. The virgin Nellikunnu beach is just a two minutes walk from the homes. Thapovan Ayurvedic Centre presents Ayurveda in its most traditional and purest form. It comes with a Green Leaf Certification accredited by the Tourism Department, Government of Kerala. The services of experienced in-house doctors and well trained masseurs help to de-stress and refresh both mentally and physically. The exotic herbal garden and the Yoga Center aid in instilling calmness and peace for body and soul. The centre provides the highest quality treatment for various ailments like arthritis, paralysis, hemiplegia, sexual weakness, mental distress and nervous disorders. A variety of authentic Ayurvedic rejuvenative programmes are offered to check into a new life. The centre has its own special vegetarian cuisine prepared according to Ayurvedic prescriptions, the menu using organic ingredients is designed to boost health and ensure longevity.